Carole King fought her way into the music business as a teenager. Along with her husband Gerry Goffin, she gave us songs we still sing along to. The musical follows her career along the bumpy road to fame and fortune. 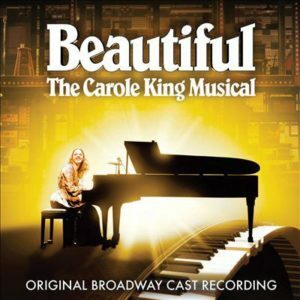 Beautiful: The Carol King Musical (original Broadway cast recording) highlights such hits as “Up on the Roof,” “You’ve Got a Friend,” “On Broadway,” “Uptown,” and many more. It is impossible not to want to sing along to this recording! It is a wonderful story with the bonus of exceptional music. Listen to the music CD or stream the album on Hoopla. Rebecca Bunch (Rachel Bloom) went to a great school, got a great job, and is about to be named partner of her law firm…so why doesn’t she feel happy? As she’s having a nervous breakdown over this, she runs into Josh Chan (Vincent Rodriguez III), her childhood boyfriend from camp, who’s giving up on the New York life to move back to his hometown, West Covina, CA. Realizing being with Josh was the last time she felt good about herself, Rebecca quits her job, ends her lease, and immediately moves to California to be with him. Only, there’s a catch: Josh has a girlfriend. 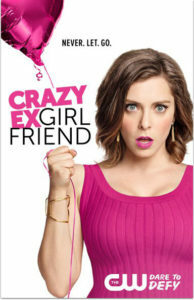 Crazy Ex-Girlfriend is a hilarious and quirky TV musical, where each song is a very specific parody of a popular artist or genre. Between its songs and lovable cast, its positive messages regarding mental health and friendship, there’s no way to go wrong with this off-beat comedy. 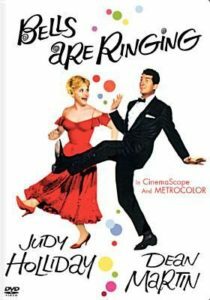 A delightfully charming musical romantic comedy, Bells Are Ringing stars Dean Martin and Judy Holliday. Ella is a kindhearted telephone answering service operator who can’t help but meddle in her customers’ lives: making love connections and arranging employment opportunities. She’s in love with one of her clients: Jeffrey, a playwright with writer’s block. The storyline is full of silliness and warmth, and the film is definitely one worth revisiting (and thanks to Debbie for the recommendation). Directed by Vincente Minnelli (Meet Me in St. Louis, Designing Women, etc.). Summer Stock is a feel-good, corny (pun intended), let’s-put-on-a-show-in-the-barn musical starring Judy Garland and Gene Kelly. His unforgettable dance with a newspaper and creaky floorboards, and Garland’s show stopping “Get Happy” highlight this cheerful, old-fashioned film. 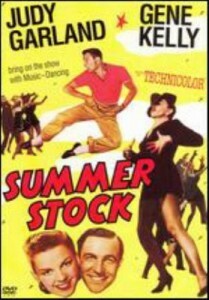 Check out Turner Classic Movies’ article on Summer Stock, then watch the film. Jeanette MacDonald, before being paired with Nelson Eddy, made several charming musicals with Maurice Chevalier. MacDonald, as the title character, owns 52% of her homeland of Marshovia. She throws off her widow’s weeds to enjoy the excitement of Paris. But what if she decides to stay in Paris? What of her 52%? Sent, for the good of the country, to woo and wed the widow is Captain Donilo, the most accomplished lady’s man the country has to offer. 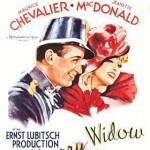 The Merry Widow is full of delightful songs and humor. If you have just finished reading In the Garden of Beasts (Erik Larson’s portrait of Germany as the Nazis rise to power and influence), you might like one of the following movie depictions of the same time and place. Cabaret (1972) is the popular musical starring Liza Minelli as the original “good time girl” who is oblivious to the changes happening around her. Based on The Berlin Stories of Christopher Isherwood. Three Comrades (1938) is a poignant story of the love between fragile Margaret Sullavan and Robert Taylor. Taylor’s other two comrades are Franchot Tone and Robert Young. Young, politically active, runs into trouble with the pro-Nazi marchers in the streets. Mephisto (1981) is a German language movie with Klaus Maria Brandauer, as an actor who sells his soul to the devil in order to keep working in Nazi-era Germany. The Harmonists (1997) is based on the true story of a successful German singing group that was forced to disband in 1934 because three of its members were Jewish. Tracy Turnblad (Nikki Blonsky), an overweight and goodhearted teenager, is able to live her dream and become a regular member of her favorite TV dance program, The Corney Collins Show,which seems to be Baltimore’s version of American Bandstand. This lively musical is set in 1962 when segregation was prominent. The issues of prejudice and integration are dealt with in an upbeat manner. See John Travolta transformed into Tracy’s plus sized mother. I finished my viewing with a smile on my face and songs in my head, especially “You Can’t Stop the Beat” and “Big, Blonde and Beautiful” (sang by Queen Latifah). Also costarring Amanda Bynes, Zac Efron, Allison Janney, James Marsden, Michelle Pfeiffer, Brittany Snow, and Christopher Walken. Hairspray was based on John Waters’ cult film Hairspray (1988) which spawned a Broadway musical and this movie version. Check out the music with the CD Hairspray: original Broadway cast recording. For another movie choreographed and directed by Bob Fosse, see All That Jazz. This classic musical comedy is pure entertainment. Set in the 1920s, Singin’ in the Rain shows the awkward transition from silent films to talkies. Everything works in this film – the skits, the songs, and the stars. The greatest movie musical of all time (according to the American Film Institute) stars Gene Kelly, Donald O’Connor, Debbie Reynolds, and Jean Hagen. Read Roger Ebert’s take on the film. Check out TCM to watch movie clips and featurettes.